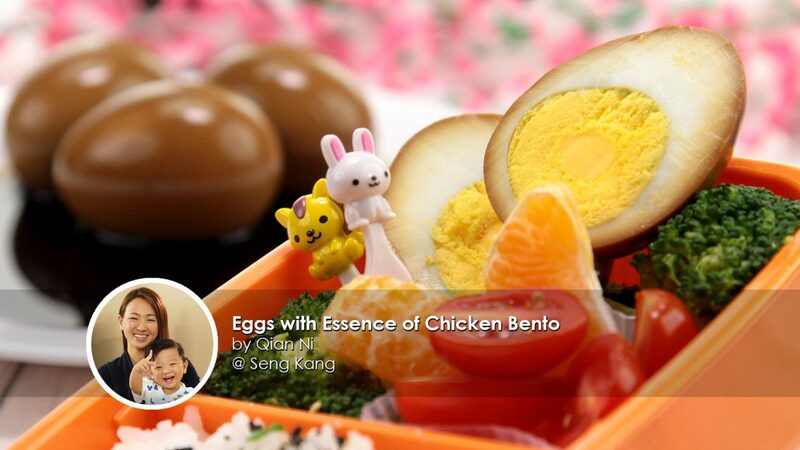 This week, avid home cook Qian Ni brings to the table a healthy and beautifully presented Eggs infused with Essence of Chicken bento. It's healthy and all natural. Because as an Arborist (aka Tree Doctor), Qian Ni loves it clean, green and pure. She's a young mother of two and making easy and nutritious meals are important to her because time is never on her side and work needs to be done in double quick time always! "To cook the perfect boiled egg, the water needs to be at least 2 inches above the egg"
Eggs are a perfect source of protein! Even the yolk has soluble vitamins and essential fatty acids that are vital in fighting inflammation of the body! Choose the right eggs and it will be enriched with Omega-3 fatty acids which are key in a baby's development. Mighty mum has coupled her love for eggs by infusing it with Essence of Chicken! What can we say - this is truly a win-win recipe that is easy to make, delicious, nourishing and beautiful. 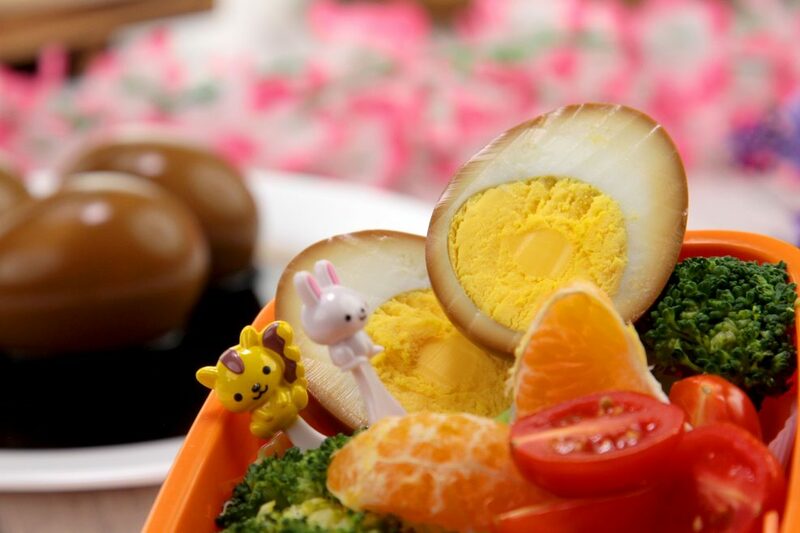 Avid home cook Qian Ni brings to the table a healthy and beautifully presented Eggs infused with Essence of Chicken bento. It's healthy and all natural. Mighty mum has coupled her love for eggs by infusing it with Essence of Chicken! What can we say - this is truly a win-win recipe that is easy to make, delicious, nourishing and beautiful. In a saucepan, boil 1L water. Add in 4 Eggs and cook it for 10 minutes. Once it’s ready, place it in a bowl of ice water and remove the shells. Tips! To cook the perfect hard boil egg, ensure that the water level is at least 2 inch above the eggs. Stir every 2 minutes to keep the egg yolk in the centre. 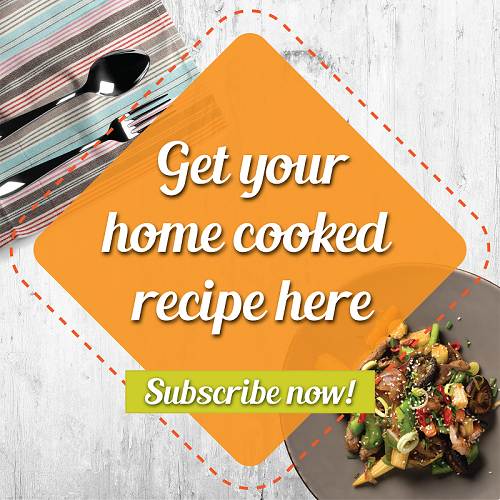 Place the peeled eggs in a bowl and pour in 2 bottles of Essence of Chicken with Cordycep. Let it soak for 1 hr, rotate the eggs every 15 mins to coat the eggs evenly. Cook the rice in a rice cooker according to the manufacturer’s instructions. Once it is cooked, transfer to a large bowl. Sprinkle rice vinegar and mix it evenly. Cover it with a damp cloth until it is ready to be assembled. In a saucepan with 1L simmering water, add in ½ tsp salt. Blanch broccoli for 2 mins or until it is cooked. Transfer to a plate. 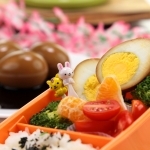 In a bento box or plate, lay the following ingredients: 1 portion of the seasoning rice, 1 soaked egg cut into half, broccoli, cherry tomato and orange. Garnish with black sesame seed and rice seasoning to make it attractive and appetising for children to enjoy!